Original article can be found in CityLab from The Atlantic. A new report and interactive map show that poor and minority offenders bear the brunt of fines and sentences for minor offenses in the state. Last year, a scathing Department of Justice report revealed how the police department in Ferguson, Missouri, made money from the fines and fees they leveed disproportionately against the city’s poor, black residents. They “leeched off the black community as shamelessly as would mafia bosses,” Conor Friedersdorf wrote in The Atlantic. But it soon became clear that Ferguson wasn’t unique. In some conservative Southern states, these practices are particularly entrenched. Georgia’s “felony driving law,” for example, which sharpened punishments for being caught driving without a license or with suspended one, has been around since 2008. This law was designed to get undocumented immigrants off the street (and out of the state, critics say), but it’s been incredibly harmful to all minority residents, a recent report by the Advancement Project and the Georgia Latino Alliance for Human Rights shows. Not too far away, in Louisiana, traffic courts have been charging poor, Spanish-speaking defendants fees for interpretation services and sentencing them to language classes that cost hundreds of dollars. But the situation isn’t much better in liberal states like California, according to a new report by a consortium of legal and civil rights organizations. This coalition, called Back On the Road California, analyzed data from the DMV and sheriff and police departments in the state. It found that the rate of driver’s license suspensions for not paying fines or not showing up to court was five times as high in California’s black and Latino communities compared to the state average. Black drivers were also much more likely to be arrested for failing to pay these fines or driving on a suspended license, compared to whites. 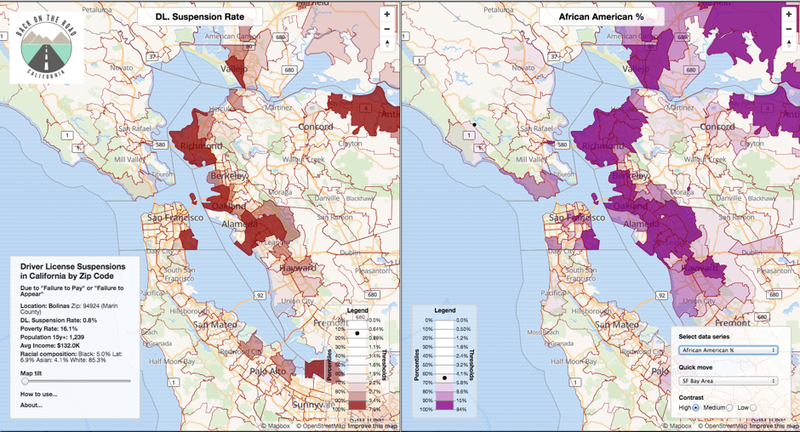 Minorities were more likely to receive traffic citations in the first place, “despite the fact that there is no documented difference in driving behavior,” the report reads. 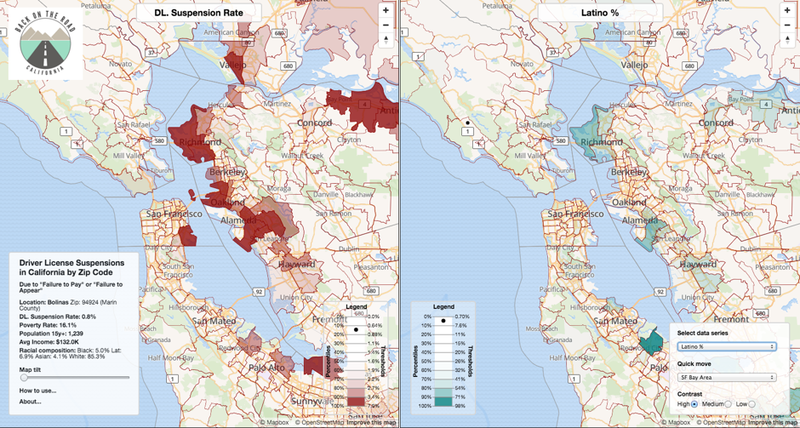 The report’s conclusions are visualized in a striking interactive map which shows driver’s license suspensions for each zip code in the state (in red), next to maps showing the high-poverty (in royal blue), black (in purple), and Latino (in green) communities (on the right). While the context may be different in California, many of the practices are chillingly similar. Here, as in Missouri, a litany of practices and policies turn a citation offense into a poverty sentence: the revenue incentives of fine collection lead to increased citation enforcement, add-on fees for minor offenses double or quadruple the original fine, and people who fail to pay because they don’t have the money lose their driver’s licenses. Once an initial deadline is missed, courts routinely deny people the right to a hearing unless they can afford the total amount owed up front, and payment in full becomes the sole means for having a license reinstated. In May 2015 (after this report was published), California Governor Jerry Brown called the situation for low-income traffic violators, “a hellhole of desperation.” He announced a 10-month program that would slash fines for those who couldn’t afford to pay. His program kicked off in October, and within three months provided relief from harsh fines and fees to around 58,000 residents of the state, according to the LA Times. Recently, the DOJ issued a letter to all state and local courts not to use “arrest warrants or license suspensions as a means of coercing the payment of court debt when individuals have not been afforded constitutionally adequate procedural protections,” and without making sure the non-payment of fines was voluntary. Some judges are making sure they’re sticking to these guidelines in their courtrooms. Most of America, however, is still playing catch-up.